did the Prince find the sleeping Princess? And, why does he feel so compelled to rescue her? 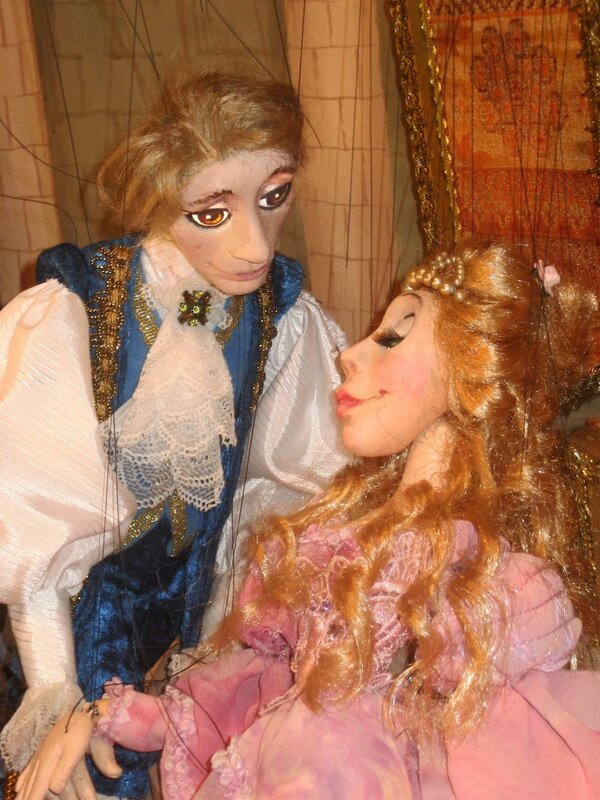 classic fairy tale comes to life as a marionette ballet. This production is the recipient of the 2015 Wilde Performing Arts Awards ‘Best Theater for Young Audiences’. Here is the outline of the PuppetART version. The story of Sleeping Beauty opens in the castle of the King and Queen who are celebrating the birth of their new daughter. The Court Jester enters the throne room and dances about happily preparing for the celebration. The Maid joins him and makes certain the thrones are ready. The King and Queen enter. The Maid reenters pushing the baby carriage that holds the tiny Princess. The Good Fairy arrives to present the baby with a special gift. Before she can bestow her gift in comes the Wicked Fairy who has not been invited to the celebration. The Wicked Fairy curses the baby Princess saying that before her sixteenth birthday she will prick her finger upon the thorn of a rose and die! The Good Fairy cannot undo the curse but she can alter it—she protects the Princess by saying that if she does prick her finger she will fall asleep, along with all of the court, but she will not die. The King and Queen are devastated and the King orders that no roses be allowed to grow in his kingdom ever again. Sixteen years pass quickly and the scene opens with the Princess entering the throne room. She will soon celebrate her sixteenth birthday. She dances about happily dreaming of her future. Suddenly the Wicked Fairy enters. She lures the Princess to her and holds out a single rose. The Princess reaches for it—touches the thorn and falls down asleep. All of the people of the court fall asleep with her. Many years later in another castle a young Prince gallops about on his hobbyhorse fighting a terrifying figure. The creature looks reminiscent of the Wicked Fairy we have met in Act One. The young Prince attacks this figure with his play sword and the figure falls over. Then the costume comes off and the Prince’s father, a young and handsome King is revealed. He rises and praises his son for his valiant fighting. The King uncovers a beautiful music box, which he begins to play. 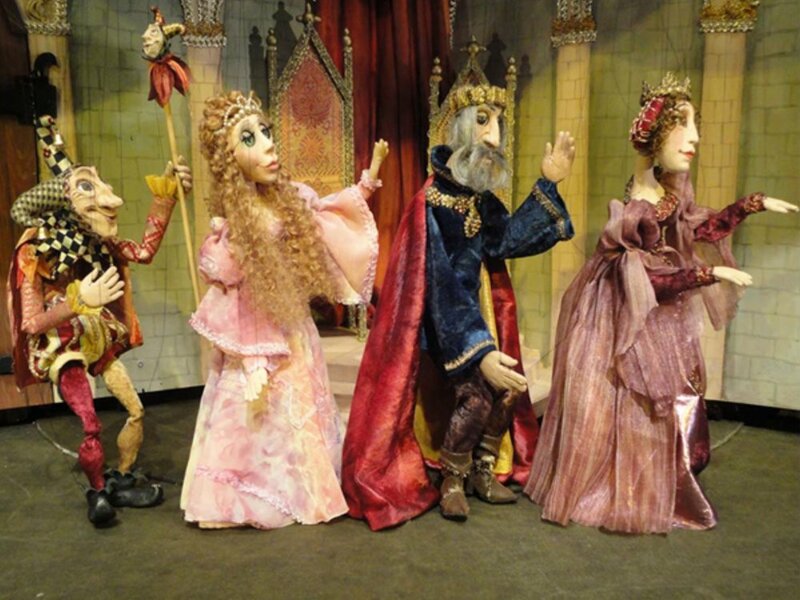 The figures of the music box act out the story of the now legendary Sleeping Beauty. The Prince listens once again to a story he has heard many times about the beautiful princess who sleeps in a castle, awaiting the arrival of a Prince who will waken her to life again. Sixteen years pass quickly by and our young Prince has grown into a strong young man. His father, now old, proudly sends the Prince off to find the sleeping Princess. The King and Prince know that it is the Prince’s destiny to find and rescue the Sleeping Beauty. The Prince approaches the castle to find it guarded by the creatures that serve the Wicked Fairy. He must fight these terrible creatures. And then he must fight the Wicked Fairy if he is to gain entrance to the enchanted castle. There is a terrible battle but the Prince vanquishes the Wicked Fairy and enters the castle. The Prince finds the beautiful Princess. He kisses her. She awakens to find the handsome Prince bending over her. Of course, they fall in love. The King and Queen, Jester and Maid, all recently awakened join them and they celebrate. Again the baby carriage is pushed into the throne room. This time it holds the new baby of the Sleeping Beauty and her husband, the Prince. The King and Queen, the Jester, the Maid and the Prince’s father all celebrate this joyous occasion. And certainly they will all live happily ever after. Reread Sleeping Beauty to children. If they know the story well enough have them tell it to you (the teacher). Make an outline of the important characters and events. A. Make a story board of the Sleeping Beauty. Children can use the internet to cut and past images for the story board or they may create their own. B. Many children will know the Walt Disney version of Sleeping Beauty which differs from the classic version. Have them do a Venn diagram of the two versions. C. Discuss the fairy tales students know. Have them list all they can recall. Ask them to identify similarities within the stories. Characters which typically represent good or evil — there is no grey area in the characters of a fairy tale — they do not reflect the complexity of people. Cinderella is all good and the stepsisters are all evil-although they are beautiful in older stories. Inclusion of magic — This can include magical objects, people or animals with magical powers. Each tale includes a hero who faces a challenge or series of tests. Good triumphs over evil ultimately in these stories. Fairy Tales are popular all over the world. Many of the stories that are familiar in the Western world stem from two collections. Charles Perrault’s Collection, Stories of Times Past, which was first published in 1697 includes Cinderella, Sleeping Beauty and Little Red Riding Hood to name a few. The Brothers Grimm collection, Household Tales, first published in the early 1800’s, includes Hansel and Gretel, Rapunzel, Snow White and the Seven Dwarfs as well as many others that would be familiar to us today. E. Bring various picture book editions of a variety of well-known fairy tales to class and have children compare the different kinds of illustrations created to depict these old stories. Some illustrators to look for are James Marshall, Paul O. Zelinsky, Paul Galdone, Trina Schart Hyman, Warwick Hutton. There are many. F. Have students create their own puppet production of Sleeping Beauty after they have watched the PuppetART production. Puppets can be simple or just use paper plates to make masks. Have children develop an original script for their production.